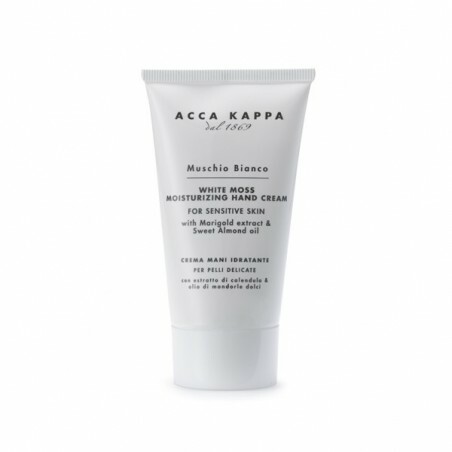 Acca Kappa White Moss Hand Cream 75ml, for sensitive skin This moisturizing hand cream is formulated for sensitive skin with Marigold extract and Sweet Almond oil. It is highly nourishing and contains Hyaluronic acid and natural active ingredients that help prevent the skin from aging. This hand cream has an exclusive formula, rich in active plant principles such as sweet almond oil, sunflower oil, shea butter, natural tocopherols and plant glycerin. 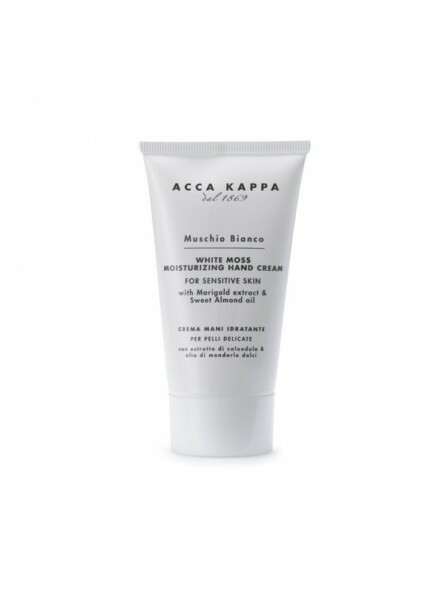 It is nourishing and moisturises effectively. The liposoluble marigold extract, with soothing and anti-reddening properties, makes the cream particularly suitable for delicate and sensitive skins. The hyaluronic acid it contains ensures a long, deep moisturising effect. It does not stain and it is rapidly absorbed. DIRECTIONS FOR USE - Apply regularly on clean, dry hands. Massage gently until fully absorbed. INGREDIENTS: Aqua(Water), Glycerin, Dicaprylyl Ether, Sodium Cetearyl Sulfate, Cetearyl Alcohol, Prunus Amygdalus Dulcis Oil [Prunus Amygdalus Dulcis (Sweet Almond) Oil], Phenoxyethanol, Stearic Acid, Palmitic Acid, Allantoin, Helianthus Annuus Seed Oil [Helianthus Annuus (Sunflower) Seed Oil], Sodium Dehydroacetate, Butyrospermum Parkii Butter [Butyrospermum Parkii (Shea Butter)], Parfum (Fragrance), Disodium Edta, Tocopheryl Acetate, Ethylhexylglycerin, Calendula Officinalis Extract (Calendula Officinalis Flower Extract), Sodium Hyaluronate, Tocopherol, Benzyl Salicylate, Hydroxyisohexyl 3-Cyclohexene Carboxaldehyde, Butylphenyl Methylpropional, Linalool, Coumarin.